Community Service Jobs are offered to the students. If a student accepts a two hour per week community job through the semester and if it is done satisfactorily, a 50% discount will be applied to their tuition. Jobs will be assigned at the beginning of each semester. One of the two hours per week may be used to communicate with family, friends and church to encourage their support of the student. This program helps to keep fees and tuition costs low and provides a greater sense of community. Bible Works ($390), Logos (Bronze, $630) or another exegetical Bible Study Program will be required. Sangre de Cristo Seminary offers a 50% tuition scholarships to 3rd year full time students in the three year Master of Divinity or Diploma in Biblical Studies programs. 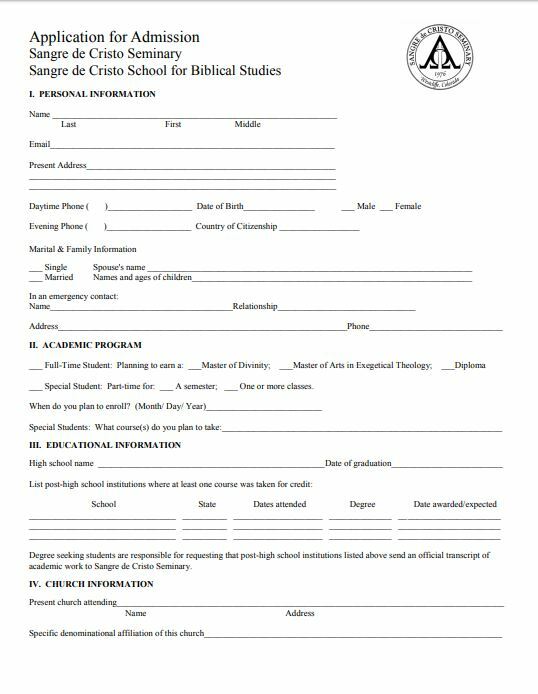 Application for these scholarships is limited to students who plan to enter full-time professional Christian ministry following graduation or completion of their academic preparation. The Ministry Tuition Scholarship is made available by the financial support of God’s people who want to encourage students in their preparation for the gospel ministry. This Scholarship covers the tuition for all courses taken at Sangre de Cristo Seminary. The student must also earn a C average or better for each semester. 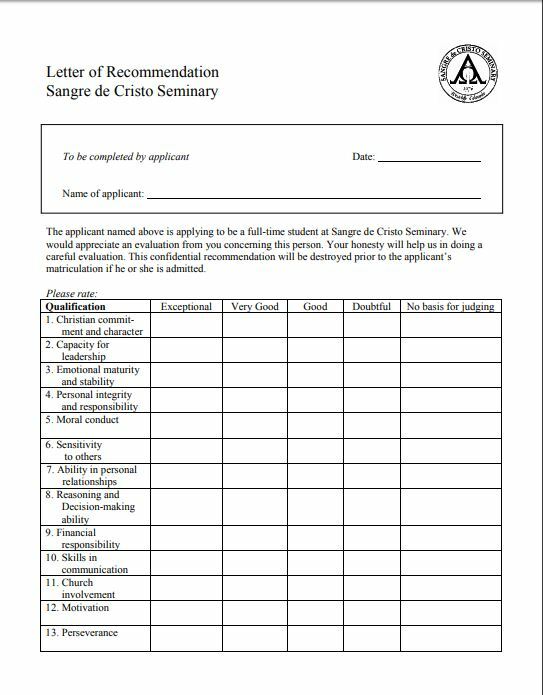 If a recipient of the Ministry Tuition Scholarship does not enter the ministry, he will be obligated to pay back to Sangre de Cristo Seminary the tuition for his education. To help prepare students for the Gospel ministry, family, churches and friends of seminary students are encouraged to help support this work. Student fees currently pay for less than 10% of the educational expenses at Sangre de Cristo Seminary. Contributors may periodically want their gift to benefit an individual student. Gifts can be sent directly to a student. However, asking the seminary to credit a student’s account or to directly give the gift to the student, while the contributor is receiving a tax-exempt receipt for the gift, is forbidden by IRS tax law. The Seminary Tuition Scholarship Committee may choose to grant scholarships for educational expenses to an individual student, as funds are made available from gifts. If the student is receiving the Ministry Tuition Scholarship, it is the committee’s understanding that these funds are applied to the Ministry Tuition Scholarship received by the student. When a student graduates, if the student’s financial account has a positive balance, and that balance is due to scholarships, it is the seminary’s policy to return the balance to the seminary’s general fund. The seminary has kept student fees at a low level and offers scholarships because of contributions made by supporters like Harold and Mary Crumpacker and their daughter, Dr. Margaret Crumpaker . The Crumpackers have been a part of the seminary since its founding, and Mary has served on the Board of Directors. After Harold went to be with the Lord in 1994, a scholarship endowment was established in his honor to help pay for student tuition. It is primarily from gifts like this memorial that the Ministry Tuition Scholarship is funded. For a contribution of $7,000.00 or more, designated for this purpose, we will start a memorial fund in honor of a loved one. These contributions are specifically for student tuition needs rather than general operational expenses. Finances for Sangre de Cristo Seminary’s salaries and ministry expenses come primarily from donations of interested friends and churches. These contributions are tax-deductible. The Seminary is a tax-exempt organization under IRC 501(c)(3) and, as required for tax-deductibility, maintains full control and ultimate discretion over all contributions for use in its ministry. The seminary strives to maintain the highest standards of integrity and accountability in every area of its ministry – including financial responsibility. The seminary financial records are annually reviewed by an independent accounting firm, the board of directors, and are open for review by interested parties. At this time because of our size and the regulations of the U.S. Department of Homeland Security we cannot accept International Students. This School has been approved by the Colorado State Approving Agency for those eligible to receive VA benefits while a student here. Classes may be audited without credit with the approval of the professor teaching the course and the Director. The fee for auditing an entire course is the same as for those who take it for credit. Spouses of full-time students may audit courses without charge.